Our IndieViews series reveals the passion, expertise, and personalities behind Indie Source’s amazing team. 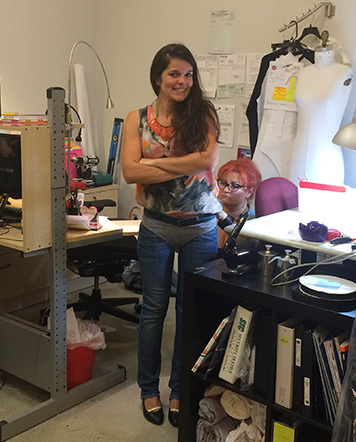 Get to know Rebecca Ellison, our superstar production assistant who helps turn clients’ fashion design dreams into reality. Describe what you do at Indie Source. I’m the trim buyer for the production team. When a client places a production order, I buy all of the zippers, buttons, elastic, and embellishments wholesale and make sure that they will work for the needs of each garment. I also order the labels that tell the buyers what the fabric is made out of and how to wash it. When we do screen printed logos or artwork, I help coordinate that, too. It’s a lot of small details that ultimately have a big impact. What inspired you to work in the fashion industry? I’ve always liked to make things–for myself and for others; for fun and for money– but I was planning on being a social worker because I was passionate about empowerment. I was actually in graduate school for social work when I realized that creating new things from raw materials is a tangible way to turn dreams into reality and that the process of creating something is empowering and has potential to change the way we live. I wound up switching career paths late in the game when I decided that apparel design is just as empowering as any kind of therapy and that I would enjoy it more than the traditional “helping professions.” I left social work school and signed up for trade school in apparel design, and I’m so glad I followed my heart when I did. I knew that I wanted to work for a smaller company where I would feel like I was part of a team but not stuck doing one thing every day, and I wanted to get to interact with the client because I want to feel like I’m helping people reach their goals. Since Indie Source is full package, I get to see the whole process and witness the satisfaction the clients get designing from start to finish. The values of the company worked well with my own, and when I met the Indie Source team I felt like I would never get tired of spending time with them, which is important when it comes to a job, so I feel very lucky to have been introduced to Indie Source shortly after going to school for apparel design. What types of clients and fashion markets have you worked with? It’s so exciting to me that we have worked on everything from t-shirts to lingerie, whimsical things like a sweatshirt with devil horns and a tail, girls’ dresses with interchangeable trims, professional uniforms, vintage dresses, even leather accessories. Some clients have done productions before and know exactly what they want and expect, while others leave a lot of decisions up to us. Each project has its own challenges but it’s always something new so it keeps me learning everyday. There are people wanting to make something that’s unique or never been done before, and there’s so much new technology in fashion, so I expect that our clients and their customers will continue to widen, and the fashion markets will overlap more and more. My favorite thing about my job is being on a team that accomplishes huge projects because everyone plays their part. When we communicate well and coordinate effectively, we can produce a huge amount of product in a short period of time, but it’s only because everyone on the team has their own area of expertise, and everyone’s skills come together in a large production. My team members are the best thing about my job because we are interdependent but we also keep each other learning and laughing all the time. What is a typical challenge that comes up in your work and how do you handle it? The timeline for a production is a part of my job that calls for strategic thinking. When it comes to certain trims, such as a shiny gold plated zipper, getting them in bulk can take weeks because they have to be made for us. By the time I know exactly how many we need and what sizes we will get, the patterns are usually approved and the fabric is often faster to get delivered and cut. 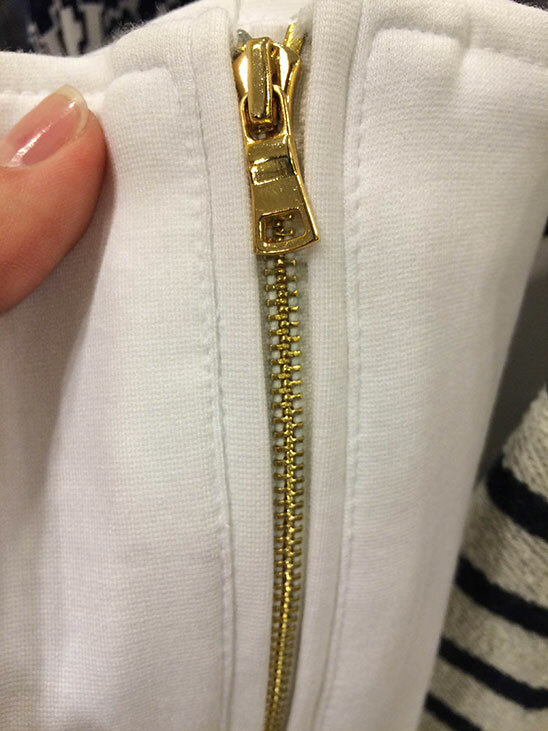 So waiting 6 weeks for zippers is too long. In that case I have to make decisions about what vendors to use based on their time frames as well as their pricing and product quality. Timing for trim buying is tricky but exciting. The atmosphere at Indie Source is both professional and fun-loving, which is hard to come by in my experience. Usually the work environment is either tense and stressful as deadlines get met, or there is too little focus on deadlines because everyone is laid back and not too concerned with their work at all. Indie Source is different because we keep a positive vibe in the office and we have fun together inside and outside of work, but it feels like each person in the office is silently keeping an eye on their calendar, their to-do list, and their work-related obligations. I never worry that a team member is not doing their job, because all of my co-workers are self-motivated and responsible people that are also a joy to be around. 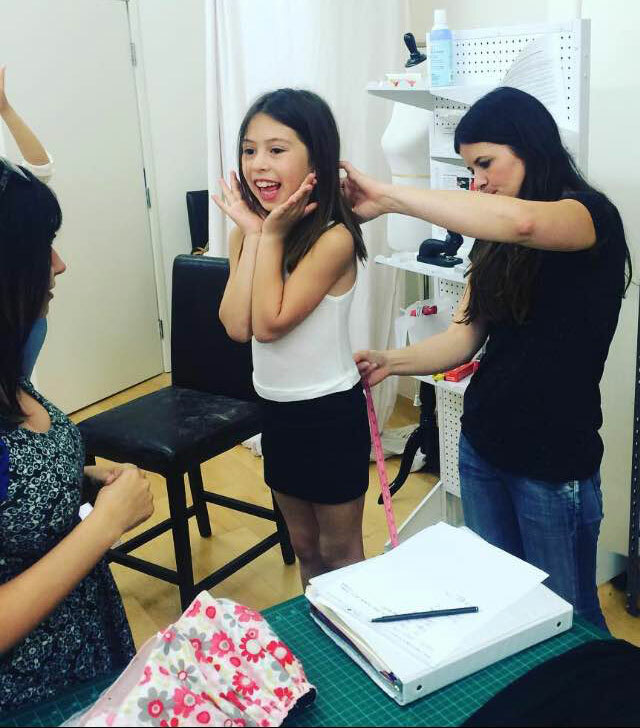 Any wisdom you’d like to pass on to aspiring fashion designers? I would encourage a new fashion designer to be very clear about their goals, and to know what elements are necessary to achieve them. Knowing what is important in order to create a look or for a garment to function perfectly is key when it comes to making a ton of decisions about the details. In some cases, a less expensive detail won’t impact the overall goal, but some details might be the thing that makes the garment what it’s supposed to be. If you’re clear about where you can cut costs without compromising your goals, you can make something that’s both affordable and exactly what you want. You just have to know what details are important for your design and make sure to keep your goal in focus through the whole process.